(CNN) -- With three places up for grabs on the U.S. Olympic track team, two women tied for third place in the women's 100 meters on Sunday -- crossing the line at exactly the same time -- which means the coveted Olympic spot could be decided by a coin toss. Sprinters Allyson Felix and Jeneba Tarmoh threw their bodies across the finish line so evenly matched that cameras recording 3,000 frames a second couldn't tell who beat whom. Both runners recorded precisely the same finishing time, down to thousandths of a second: 11.068 seconds. Two women beat Felix and Tarmoh: Carmelita Jeter and Tianna Madison. Their first and second place finishes give them the chance to represent the United States at the Olympics in London this summer. 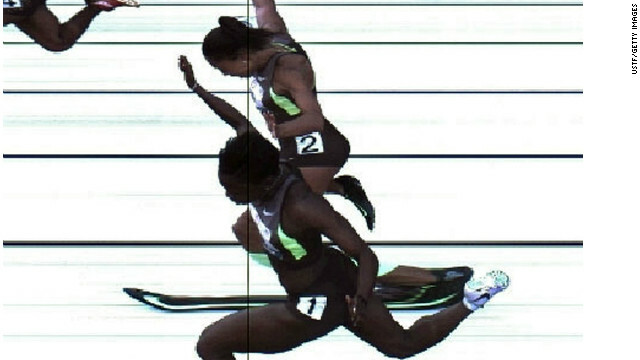 But the photo finish leaves USA Track & Field with a dilemma: Who gets the third slot? There appears to be no precedent for a dead heat at U.S. Olympic Team track and field trials, prompting the U.S. Olympic Committee to announce new rules Sunday. One of the runners can give up her claim to a spot on the Olympic team. If neither one takes that unlikely option, they'll be asked if they want to run a tie-breaking race or flip a coin. If they choose the same option, the committee will respect their wishes. If they disagree, they'll have to race for it. And if both athletes refuse to declare a preference, officials will flip a coin -- a U.S. quarter to be exact. Leaving nothing to chance, other than the flip itself, the rules also detail who gets to pick heads or tails and how the coin should be flipped. "The USATF representative shall bend his or her index finger at a 90-degree angle to his or her thumb, allowing the coin to rest on his or her thumb," the rules say. No date has been set for the tie-breaker to take. Both women have other races to run over the course of the week.